One thing that I am doing as I update old drawings is to review my sketch books for ideas that never made it off the page. 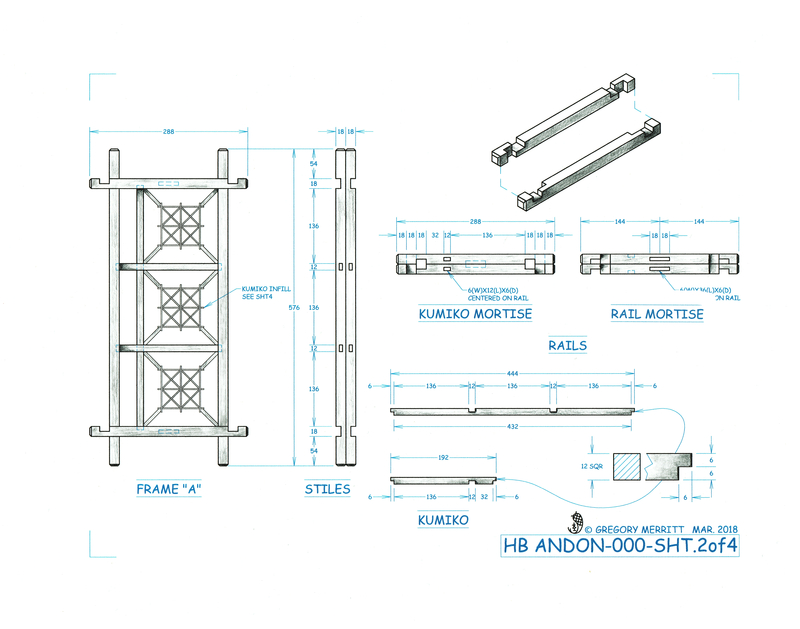 One such idea was for a Japanese style lamp (andon). Originally, the andon was a lantern consisting of a washi (paper) covered wooden frame which was lite with either a candle or oil lamp. Some sources claim that the fires resulting from these lanterns killed more people in Japan than the samurai sword. Despite that, the form remains popular to this day. Thankfully the open flame has been supplanted by modern electrical lighting. 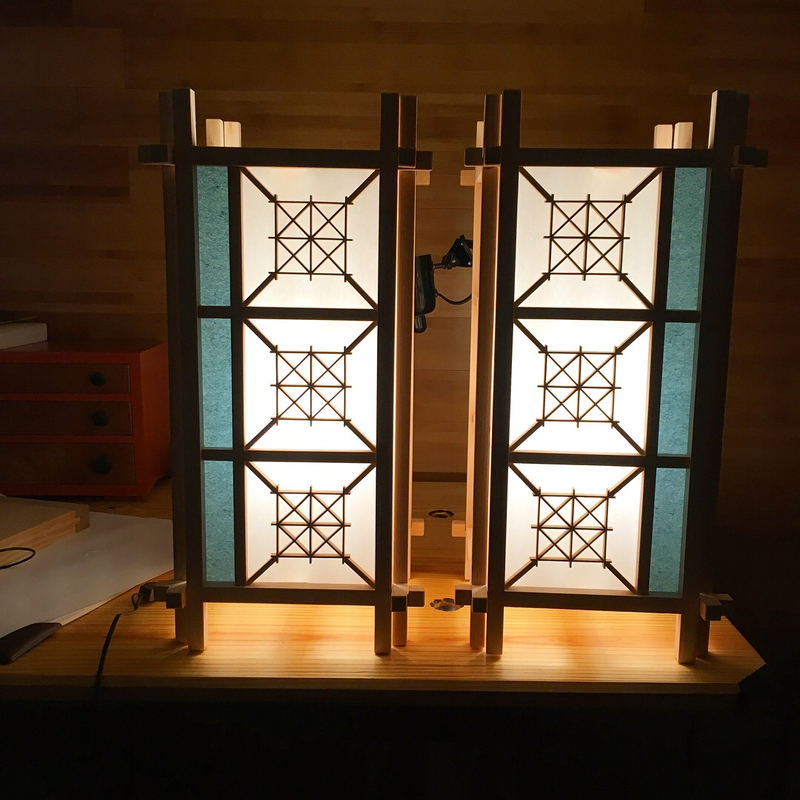 Today, most refer to this style of light as a shoji lamp, due to their resemblance to paper covered shoji sliding doors. No matter what you call it, there are innumerable variations to found, both in appearance and in construction. So there should be no harm in adding one more variation to the mix. 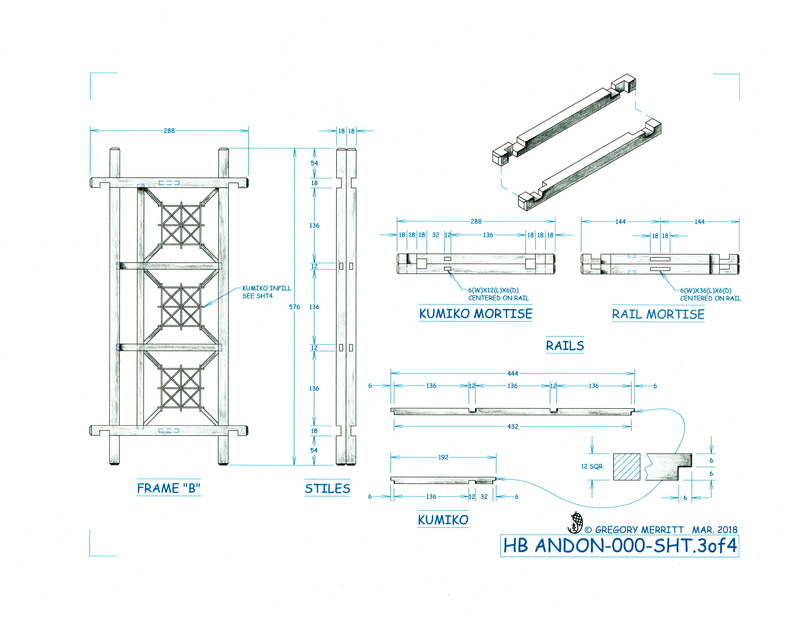 I had a few criteria when I set out to design my andon. It needed to easily disassemble so that the paper could be changed in the future. It also needed to be designed around readily available materials. 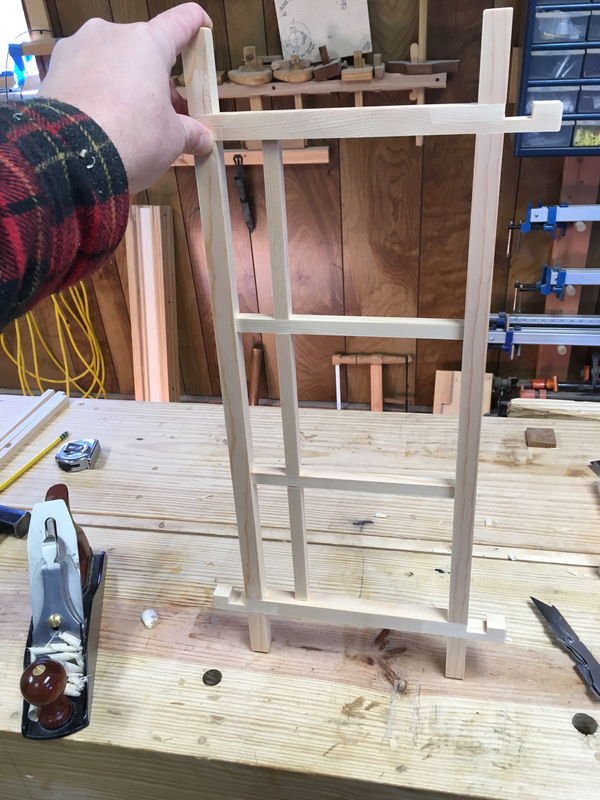 I met my first requirement by designing simple interlocking frames. 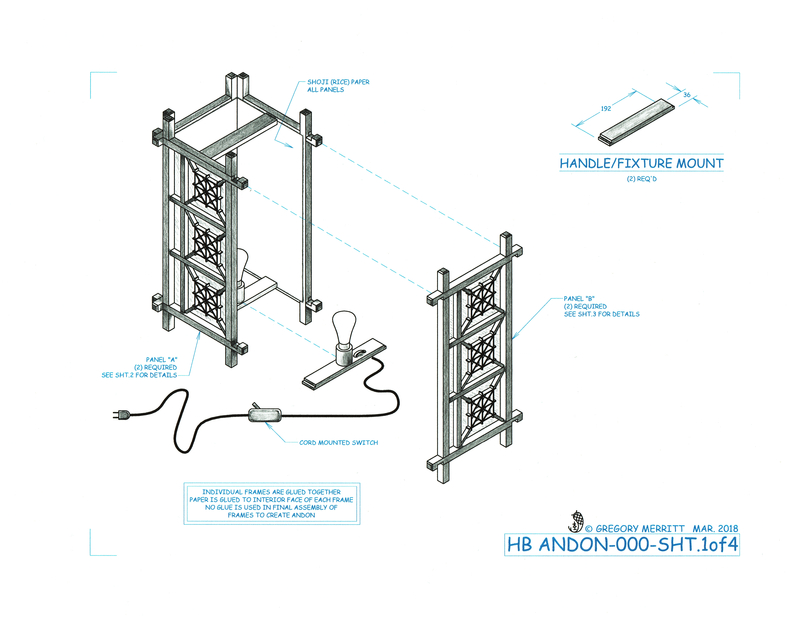 The entire lamp can be assembled or disassembled in a matter of a couple of minutes. Of course I complicated it by using an asymmetrical pattern that required two differing sets of frame assemblies. If you use a symmetrical design, than all four frame assemblies can be identical. The second requirement was met by using lumber from the big box store as well as the local craft store. The shoji paper is really available from online retailers and most craft stores carry a roll of Chinese calligraphy paper that could be used as well. I began by visiting the local big box and culling through the pine boards looking for one that had tight straight grain. I neglected to take a photo, but the board I chose was from the worst grade of lumber that they carry. Huge knots and splits, but perfectly clear lumber resided between all of those knots that would yield enough stock for two andon. Once home I broke the board down into the basic pieces on the table saw. 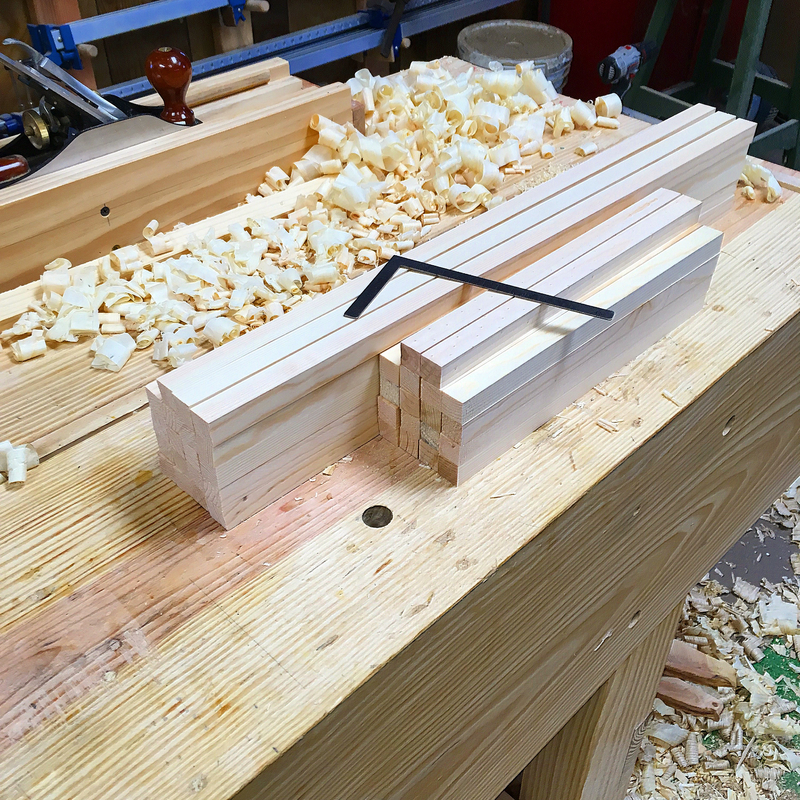 To ensure that all of the pieces were uniform I used a simple planing jig upon which my #4 or #5 plane rides. 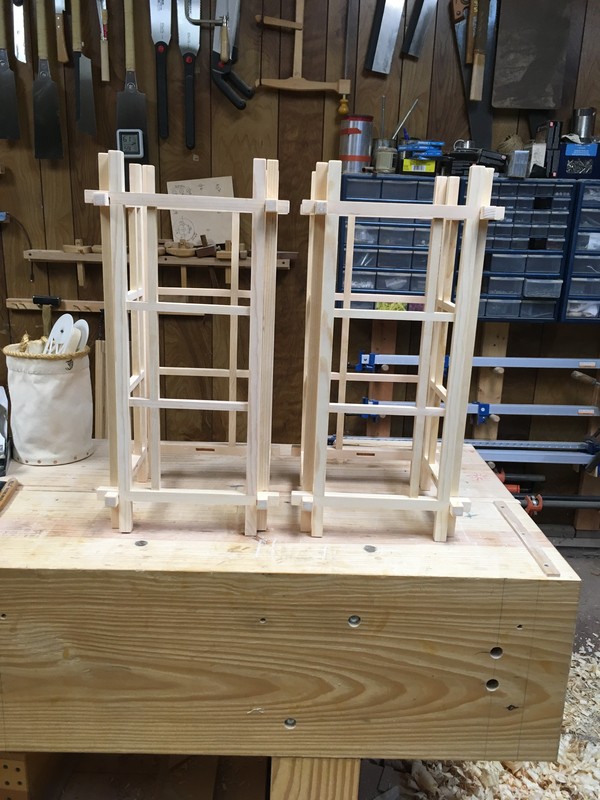 The frames are made up of a series of half lap joints. The key is to gang the parts together for layout and accurate cutting. Mostly just a lot of repetition of the same operation. Consistency is the key and it is best to complete each operation on each piece before moving on to the next. 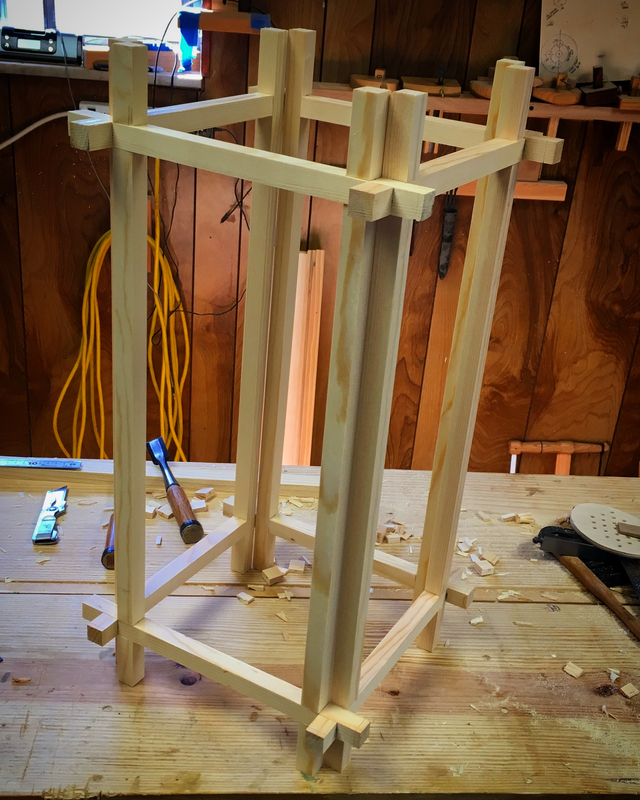 The basic grid work for each frame is more half laps and that sub assembly is joined to the frame with mortise and tenons. The pieces for the grid were first ran through the thicknessing jig. 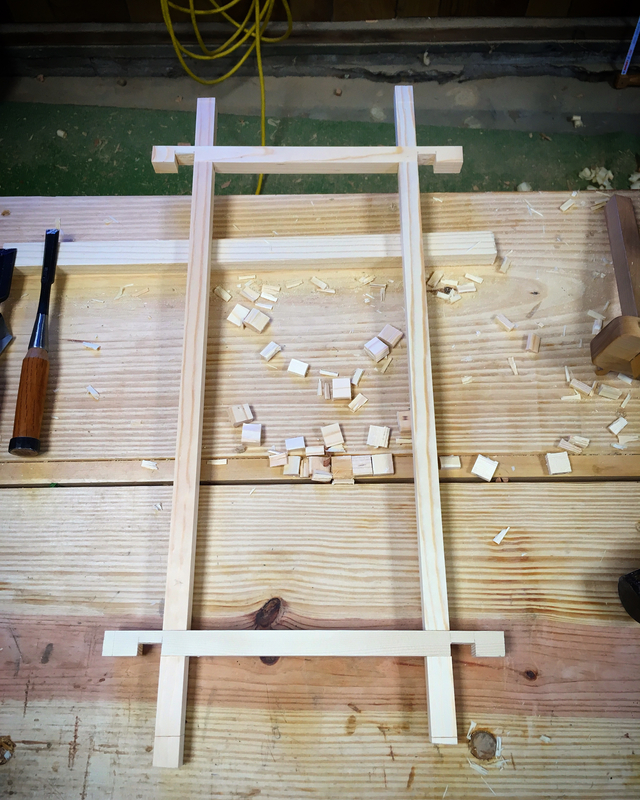 Then the joinery was laid out and cut as with the frame pieces. One of the reasons I wanted to build this style of lamp was to try kumiko. 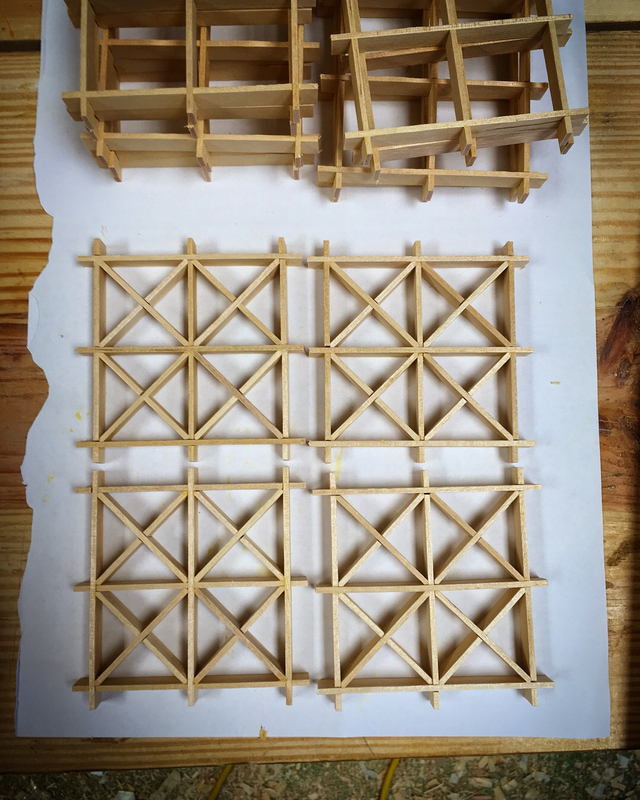 Kumiko is the Japanes art of creating decorative grid work infill with thin, precisely fitted, pieces of wood. There are an array of specialized tools and jigs for the creation of kumiko and that can be intimidating for the uninitiated. 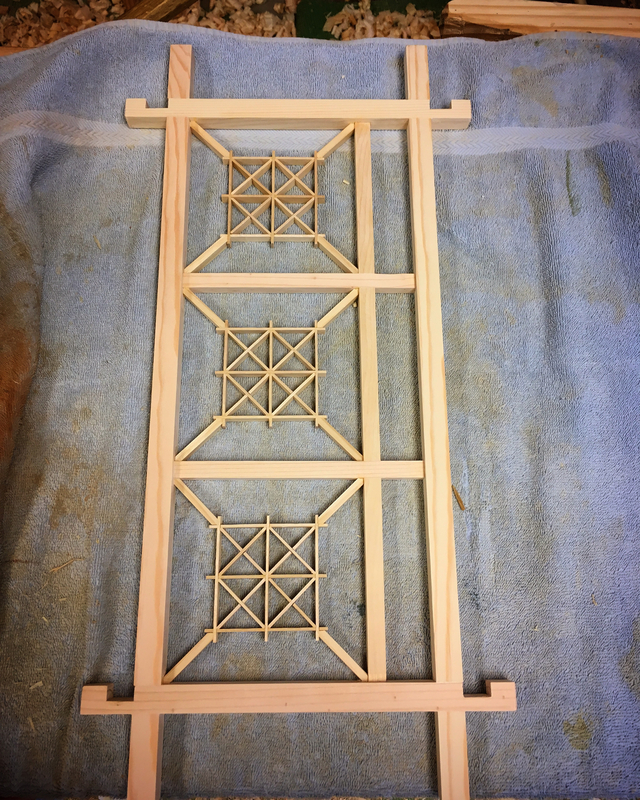 I wanted to come up with a way of experimenting with kumiko that was a little more accessible to not just me, but the average woodworker. The biggest hurdle, at least for me, was how to generate a quantity of thin stock. If you have ever tried planing anything less that 1/4″ (6mm) thick, than you know it is a challenge. Now imagine generating a hundred or more linear feet all the exact same thickness. The Japanese have developed a special plane and track system for this. Commercially available versions are expensive and building and accurate on can be tricky. The thicknessing jig that I generally use will work, but tends to generate uneven results due to the bowing of the thin pieces. Than I had an idea. Actually more of flashback to my childhood. Just about every elementary school art class had two staples beyond the obvious. Modeling clay and popsicle sticks. Wooden craft (popsicle) sticks are inexpensive and uniform in size. So I gave it a try. 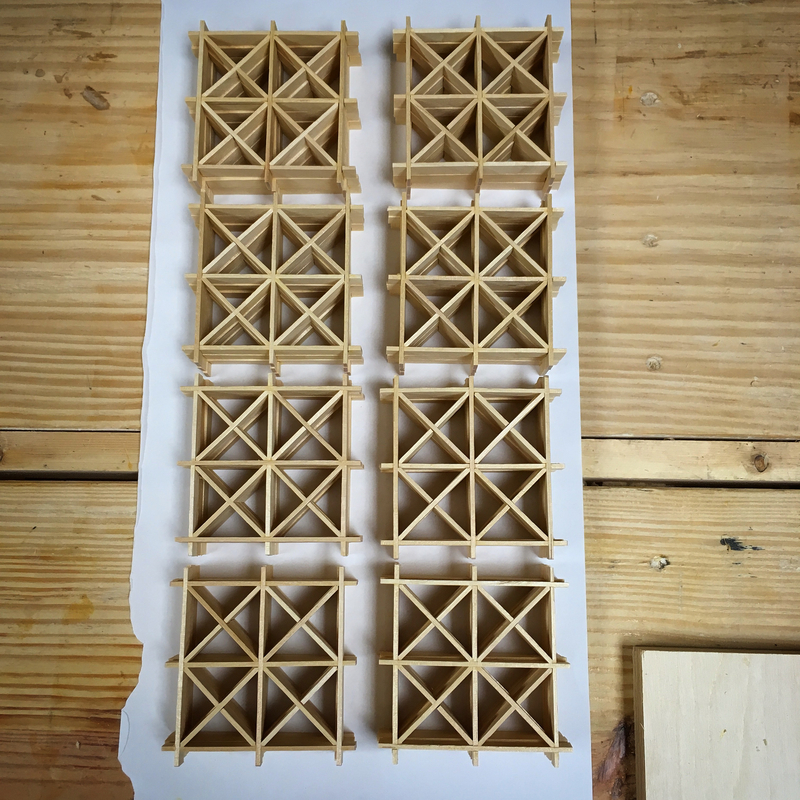 Once I was satisfied that the popsicle stick idea would work I worked out a design that would only require a simple 45deg trimming jig and worked out how to cut the few hundred required pieces accurately and consistently. A couple of makeshift jigs would do the trick. 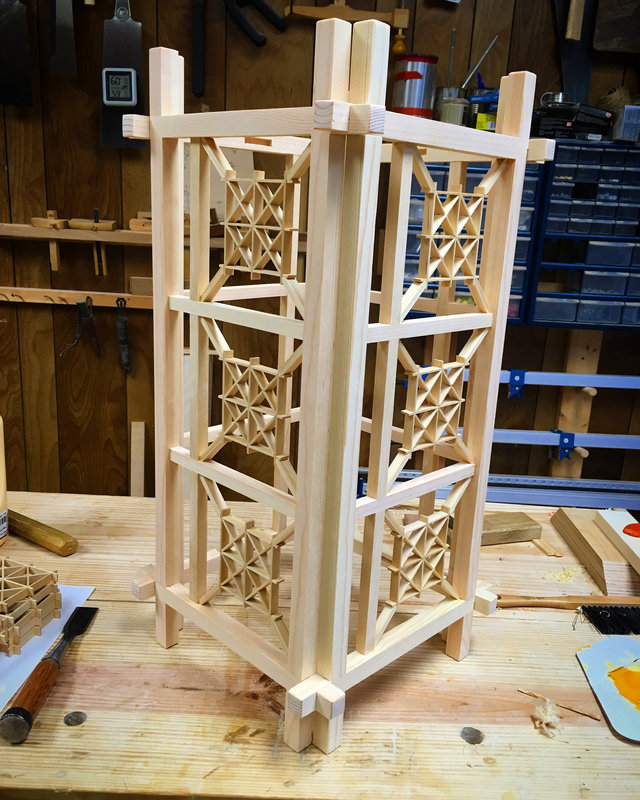 The first jig was cut the pieces that combined to create a square grid. 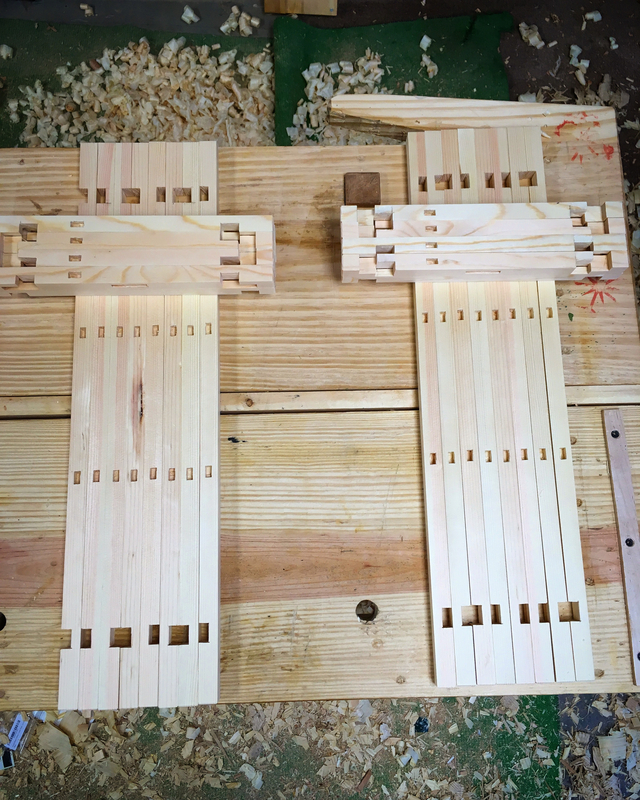 Each piece is identical and joins the others with half lap joints. The jig below allowed me to establish the correct length and saw the half lap joints. 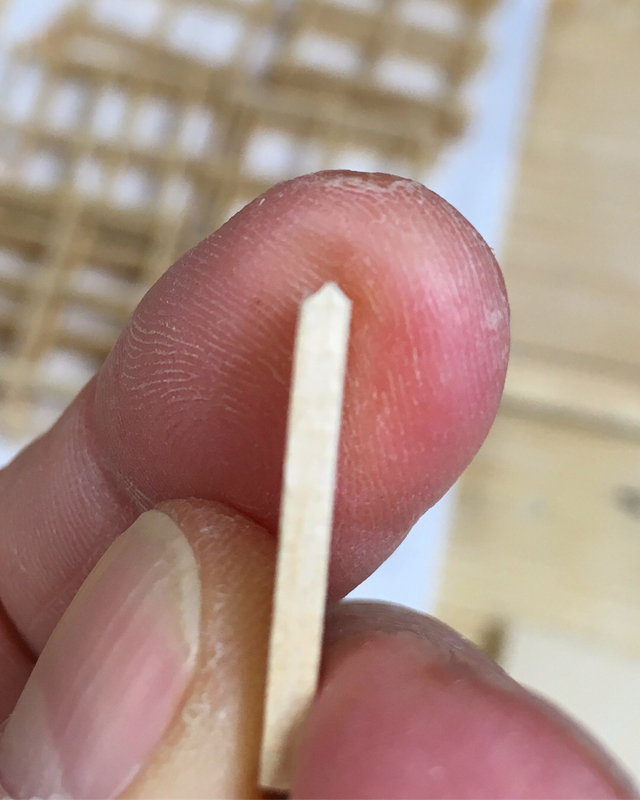 A popsicle stick is only 1/12″ (2mm) thick, making cutting both walls of the half lap joints a little tricky. 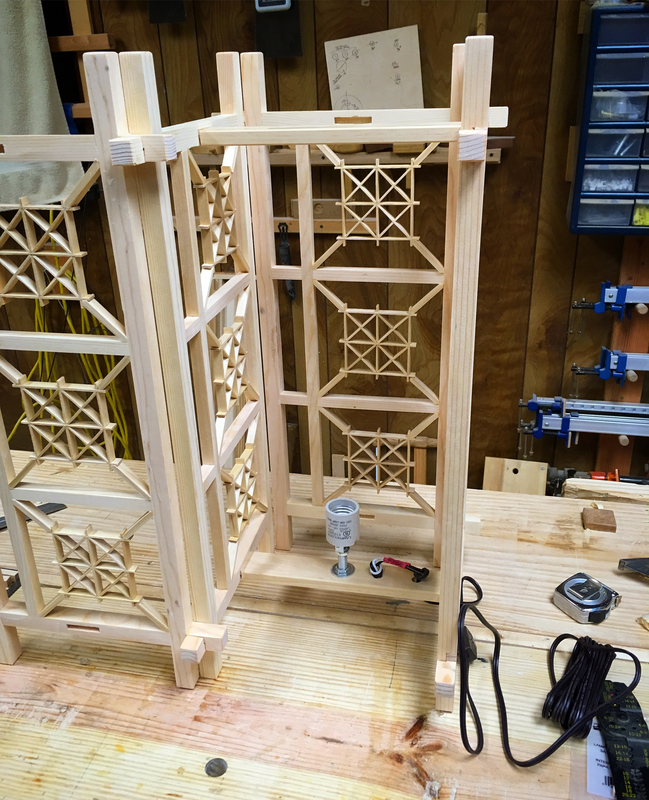 I solved this by using the jig to saw the first wall, then rotating the pieces in the jig and using the same kerf line in the jig to saw the second wall. One hundred forty four pieces and a little glue later, I had all of the base squares assembled. To create further visual interest, I decided to infill the individual square of the base squares with a simple “X” pattern. Again the half lap joins these pieces. 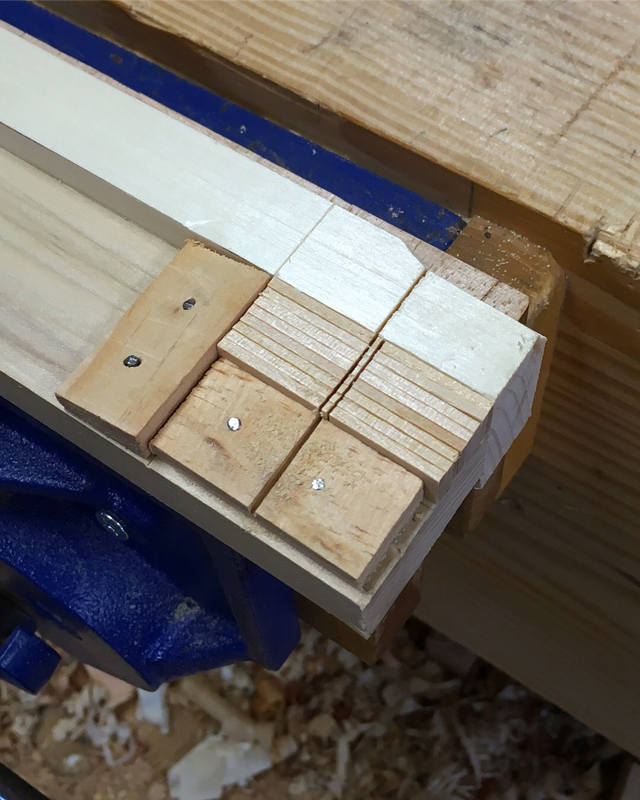 The added complication is that each piece needed to have their ends mitered at 45degs. So two more jigs were needed. One for the planing of the miters. One hundred ninety two pieces and a little glue later, I had the infills completed. 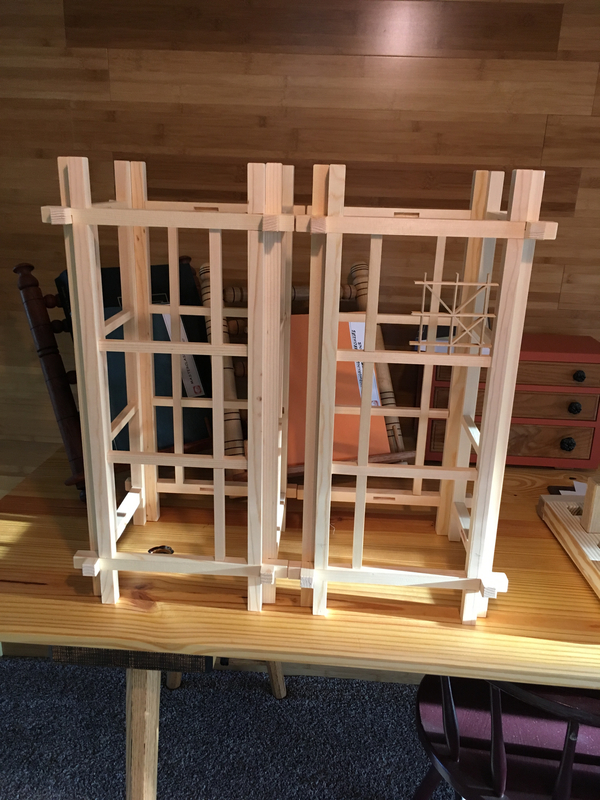 To install the kumiko squares into the frames of the andon I had originally planned on utilizing the popsicle sticks, but that didn’t quite work. There needs to be tension on all of the pieces for a good fit. 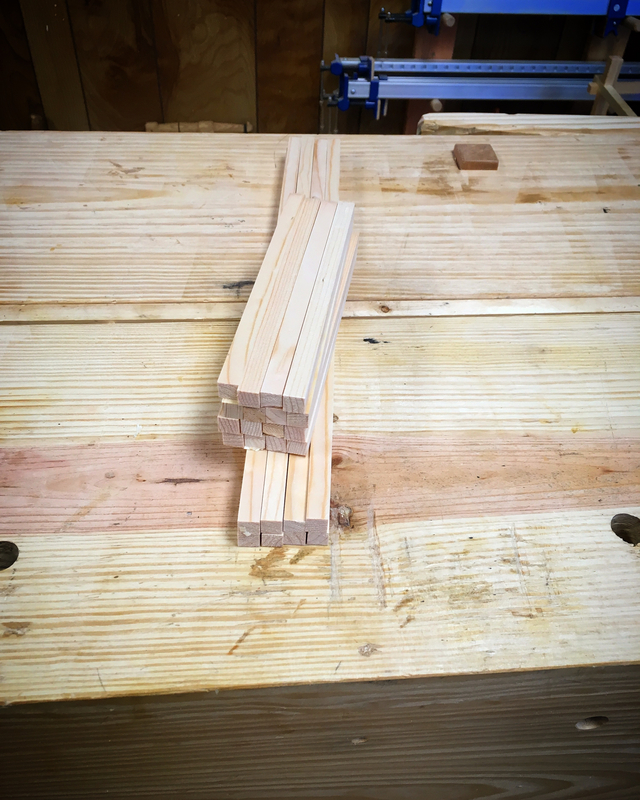 The resulting miters on the ends of the popsicle sticks just did not have enough bearing surface to hold the tension on the squares. 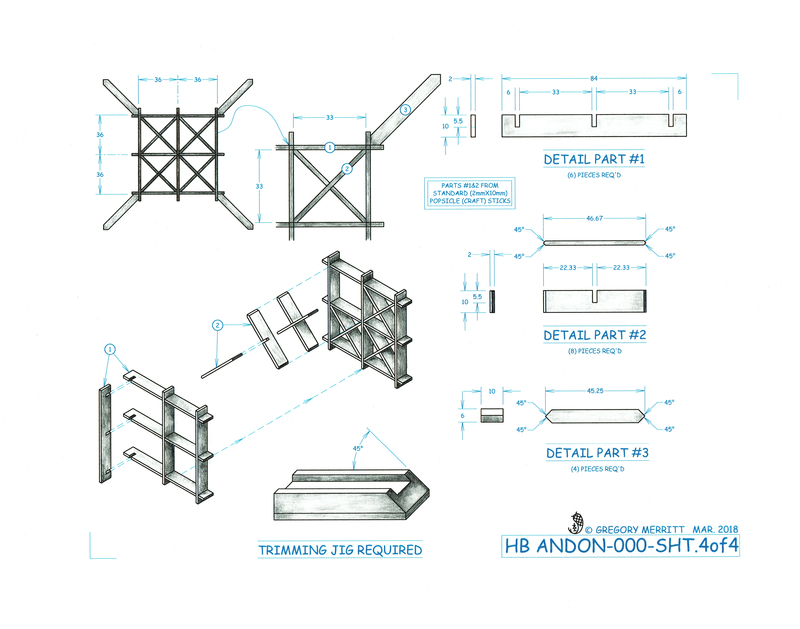 The whole assemble would just end up being rotated out of alignment to relieve the tension. So I grudgingly increased the thickness of the mounting pieces to 1/4″ (6mm). Luckily the big box store has door jam stop material that is 1/4″ thick. 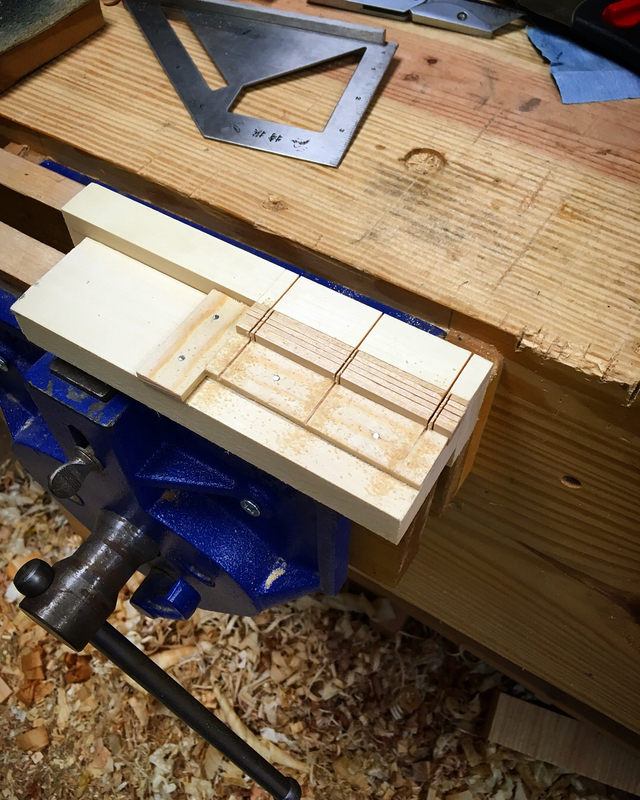 I simply cut strips to the required 3/8″ (10mm) width with a cutting gauge and used the thicknessing jig to clean them up. 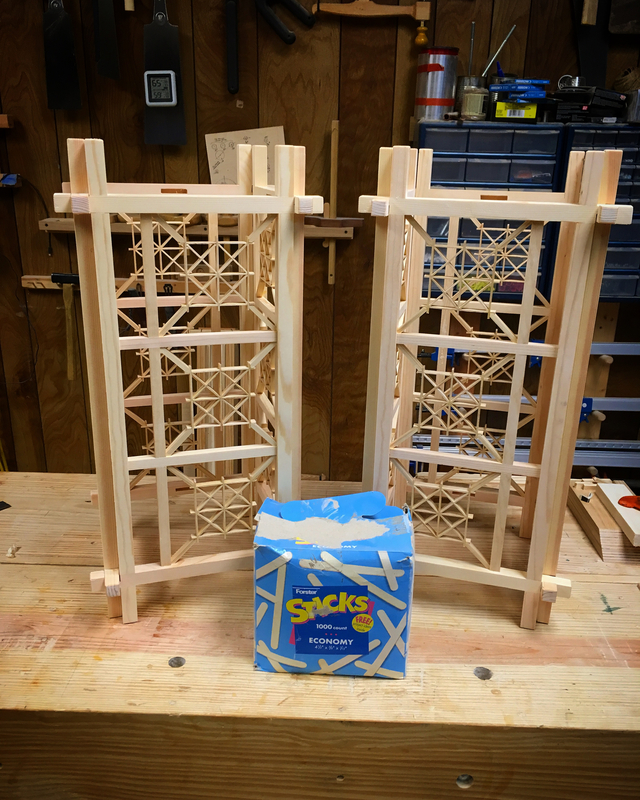 After a little trial and error to find the correct length, the pieces were mitered on the trimming jig and glued into place. To create a lifting handle and a platform on which to mount the light fixture I installed a simple board at the top and bottom of two opposing frames. I applied no finish to these. I’m going to simply let them age and patina naturally. In a few years they should take on the familiar golden orange of aged pine. Installing the paper was pretty straight forward. The important thing is to use a water-soluble glue. This will make it much easier to remove the old paper when and if it needs to be changed. I went with a commercially available rice paste, but you could be fancy and make your own rice glue. I used a basic white shoji paper and a single strip of blue washi that I have on hand for my bookbinding project. I’m happy with my first irreverent attempt at kumiko and like how these andon turned out. Hopefully I might even inspire you to give it a try. One important note. The mounting height of the bulb greatly affects the amount of light cast by these lamps. I have since added a longer rods to raise the fixtures closer to the tops of the lamps making them much more suited for my living room application. 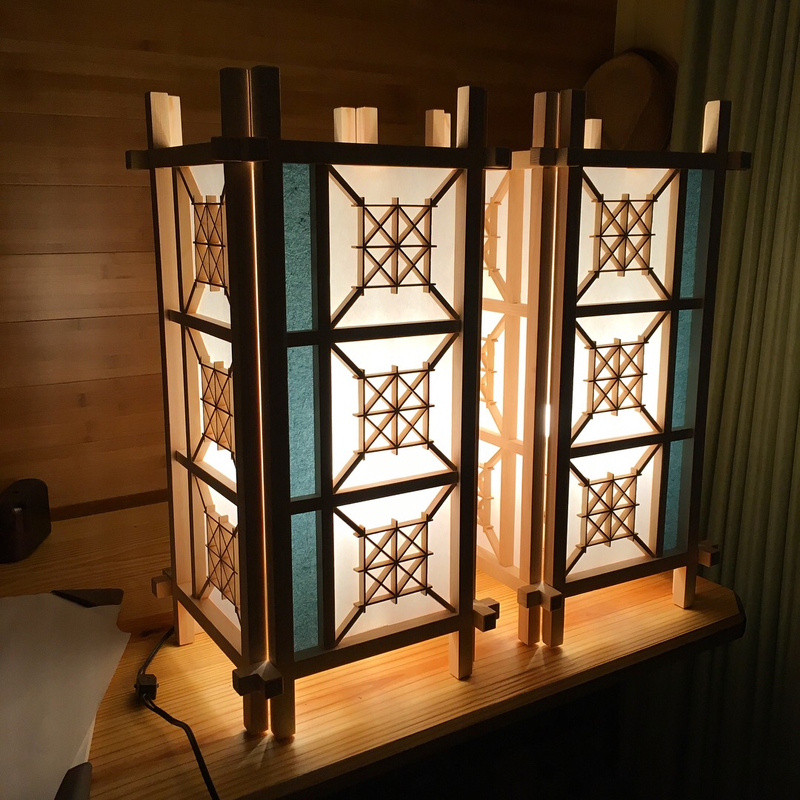 This entry was posted in Design, HB Andon Lamp, Illustrating and tagged andon, kumiko, miter jig, rice glue, shoji lamp, thicknessing. Bookmark the permalink. Greg, those are absolutely stunning. You’ve got to be proud of them. It’s hard to fathom the patience and time it must have taken for all the fine details. Excellent use of big box “lumber” and Popsicle sticks, btw. Thanks Matt. The kumiko is not as time consuming as you might think. It really only took a few evenings after work to complete. Excellent work Greg. Same for your illustrations. Wow that is beautiful Greg. Thanks Salko. I appreciate that. Now we know why we haven’t heard from you this past century or so. What is particularly impressive are the ways you found for repeating accurate cuts (without buying the $1600 Bridge City Jointmaker Pro). Beautiful results, and many THANKS for the how-to pics. Thanks Bob and your welcome. The ideas for the jigs came directly from videos I found on YouTube. 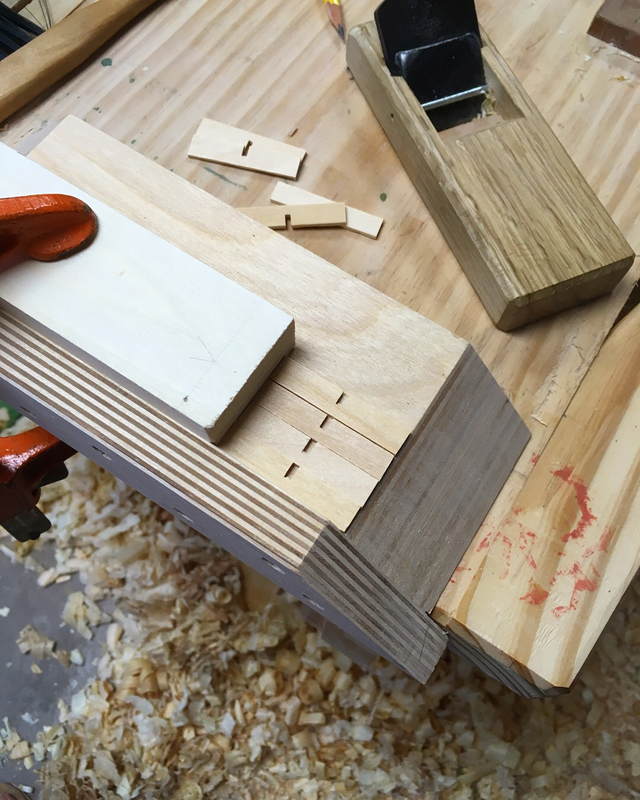 The jigs are simple and greatly speed up the process. A couple week ago just for the sake of experimenting i got a cheap small (6″ 22TPI)Japanese style saw with a plastic handle. What a surprise on a perfect clean cut. 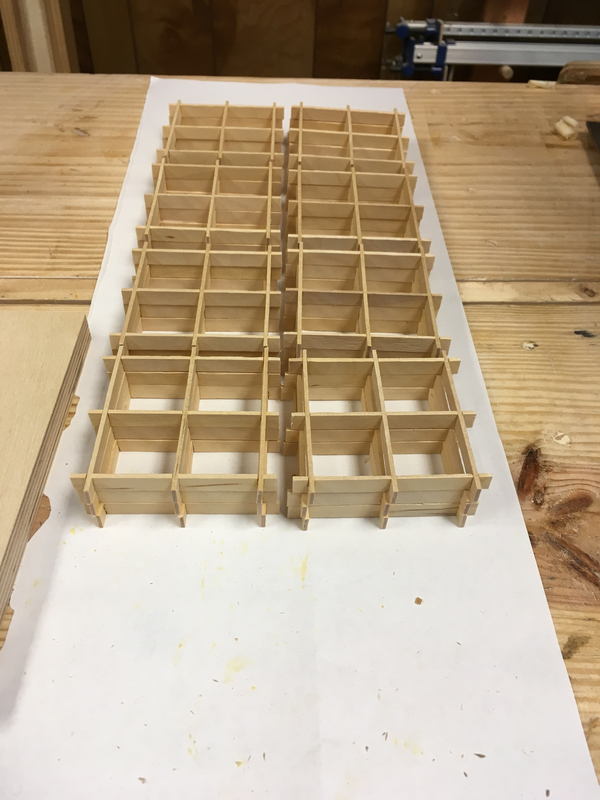 My question: For small scale work like this (or my doll beds) do you use a regular size saw (i suppose its a dozuki kind) or do you got or see some practical advantage in a smaller one 7.1 vs 9.4″? For furniture scale work I like a 180mm ryoba. For small scale or very fine work, I use a 270mm dozuki crosscut saw. If you can only afford one, get the 180mm ryoba. I built these lamp with that saw and it worked just fine. The extra fine teeth of the dozuki does make everything slightly easier and the cuts are cleaner. Just look at you… you’ve grown up Greg! When Rosa ask about it I’ll tell her it was because of your advice! I was going on the Zona saw route -Paul Sellers advice- but last moth the prices went more then double (import taxes) so i was looking for alternatives.